Fushigi Yuugi Special: Nakago Shikkari Shinasai! Lupin III VS Detective Conan the Movie is one of my all-time favorite films. Bless this man. Is he related Isayama, Hajime? I wish he could convince the people to get another season of Air Gear and History's Strongest Disciple Kenichi. Air Gear and movie 1 of naruto shippuden, this guy's a genius! I wanna help make animes like this man. I was so happy when I met him. 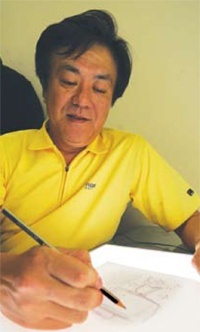 This man directed History Strongest Disciple Kenichi, Air Gear, Fushigi Yuugi and many more. I think, it's quite possible to call him one of the best directors in our time. Forgive my bad english.